Edit 21 feb: new version uploaded. Censers now spawn on the floor, worn rope and rusty daggers fixed. Edit 23 feb: new version uploaded. Fixed crash when goblins flee, castleguard dialogue is back, goblin monks are back to normal, a ‘v’ shortcut reminder is added to the main menu. I’ve put up a development version of v2.5 on the downloads page. It is mainly intended for those of you who are interested in giving early feedback and report bugs before the official release. If you give me feedback before the official release, I will give you credit in the changelog/anouncement post. If you are interested in giving feedback, I suggest that you first do the two “what’s new” tutorials in v2.5 and also read the changelog (the longest so far I think…). The reference has also been updated to v2.5. However, if you want a cleaner first experience less likely to contain bugs I recommend waiting to the official v2.5. Ha, first question: would it be possible to have Unseen Tiles displayed in Immersion Mode please? I envision immersion mode to be that you can only see what is around you. Think of it like an old 2D game where there were no “memory” tiles. I actually want the impression of feeling a bit “lost”. You can quickly access the map by pressing ‘v’ to see remembered things when you need (which you probably have to do much more often in immersion mode). Play around a bit with it and see if you like it. Right now I’m hesistant to implement a “hybrid” where you can see the remembered tiles as well. I didn’t about “v” thanks. First bug found, in the second tutorial the Dagger is identified already without having to walk close to it. > I didn’t about “v” thanks. So I’ve find a Mace and a Flail and noticed that they display Damage differently in the equipment panel. Mace has Damage displayed on the “On Hit” section while Flail has it mixed with the other stats. I think it’s a little bit inconsistent this way no? rElec of the Thunder Flail isn’t displayed its stats panel. Thanks! Will look into both these bugs! So rElec and rAcid is now displayed in the *status* panel (lower right) instead among the attributes because they are rare and less important. The thunder flail seem to display correctly for me. Pressing X here does nothing. That’s a bit confusing. – Piece of Bread is pre-identified as simply “Item” and not Food? So, I don’t have any other weapon. I’m screwed right? I can’t use my fists anymore because of my negative martial combo. 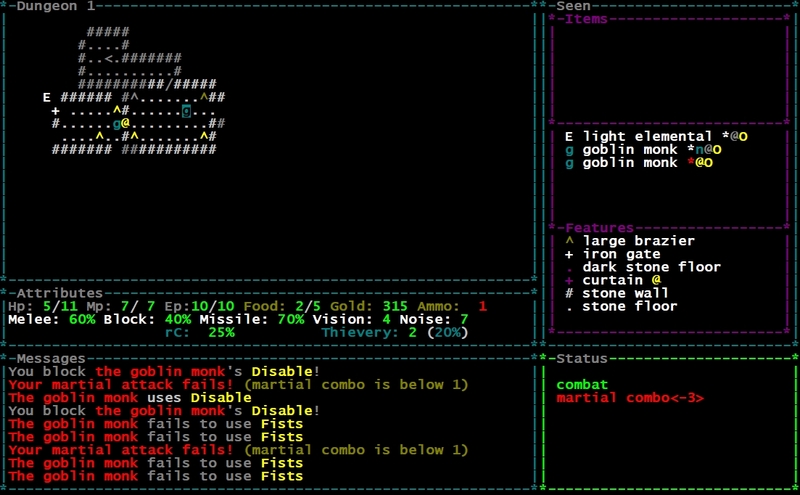 I just feel like I couldn’t have done anything here and trying to run away gives Aoo to the Goblin Monk who will kill me. – Money Monkeys turn invisible when fleeling now?! It’s not described in their description. Well I don’t have a lot of time to thoroughly test the game but I haven’t told you how much I like this version! The small touches like the new fungi tile, the block animation, the NPCs, the mysterious items (fantastic choice I think), etc. Congratulations and thank you again for this amazing work! My only “concern” is that I guess it wouldn’t be easy for a beginner to get into it. I’m amongst the lucky one to be here since a while and appreciating each and new iteration, yet there’s quite a lot mechanics to remember now. Not quite, you can still run away and lock them up. This version is really great, lots of builds that do more than just combat, every item is viable. Actually the goblin monk is fast and comes early in the dungeon so it is very possible to encounter it without alternative weapons or teleportation. I have removed this ability now. > This version is really great, lots of builds that do more than just combat, every item is viable. Awesome, that is what I was trying to go for! so I have started as a complete noob with version 2.4 and thanks to the great tutorial levels it was not a problem. So far it’s pretty good, improvements all around. Except confirming a message every step you take while slimy gets extremely annoying. Agreed. I might replace the prompt with a warning in the status panel along the lines of “Melee weapon ineffective”. Is that what slime does? I thought it just reduced acid res significantly or something. Slime has the old effects but in addition it reduces martial combo. So if you are wielding a martial weapon (like your fists) and step in slime, your martial combo will drop, if it drops to zero you can’t attack. This should probably be in the tutorial! One way you can approach this is to instead have a sort of “cooldown” on the prompt. If it’s an important situation they need to be warned about then removing the warning outright can be dangerous, so instead warn if they haven’t moved in X milliseconds, but postpone the next warning with each successful non-warned move after that, since clearly they remember the warning and are still moving. Then after being still for a while (perhaps while doing other actions or checking out inventory/info, etc) the warning will come back to remind them when they attempt to start moving again. Thank you for the tip, that’s a nice idea that could work! AMAZING!!!!!!! 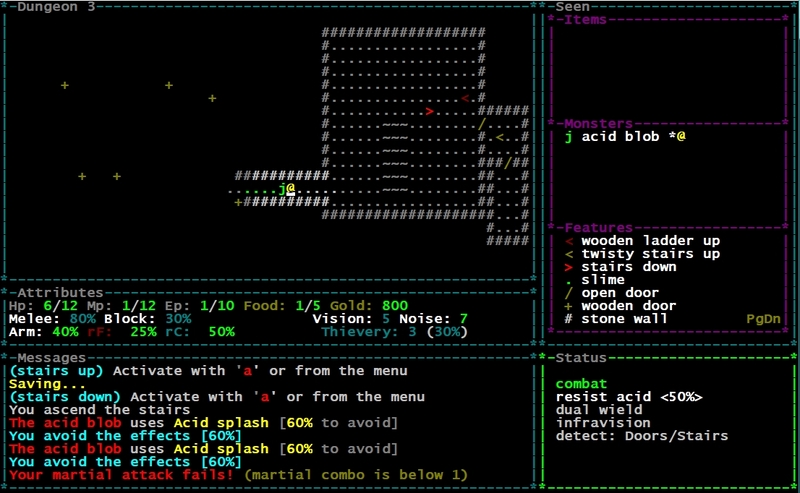 I say it everytime but this is for sure the BEST roguelike of all time. Not sure how I feel about immersion mode, the loss of flavor text on items or not knowing what something is until your next to it… im sure i’ll get used to those things though. I did find a bug already though. An item called “worn rope” with the same glyph as a whip. Upon using it the game crashed. Otherwise, the burst spell radius previews are amazing, thievery is fun as hell and martial arts as well! I haven’t had luck with a censer build yet. 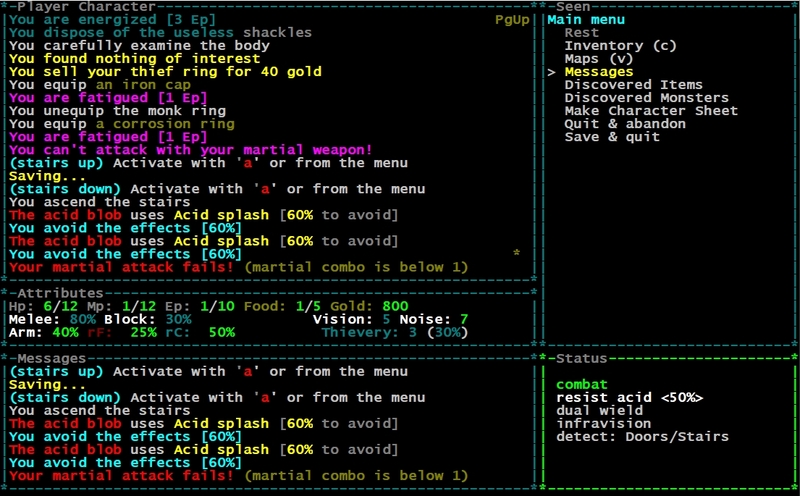 > I say it everytime but this is for sure the BEST roguelike of all time. I’m happy to hear it every time 🙂 Thank you very much! This one is optional so you can always turn it off if you don’t like it. A thing that I forgot to mention in the tutorial is that you can now press ‘v’ as shortcut to see the entire map. Immersion mode seems controversial, but options are always good. Ah yes, and it turned out that censers don’t generate on the floor… which is why you haven’t got such a build yet. Ok after playing more… its extremely hard to get a thievery build working. I found a runed (i think?) dagger that granted me the spell “execute” (massive damage! awesome) but it lowered my vision by 1… making it actually worse and doing what its tended to do. kind of a strange interaction. Usually you have to carry around all sorts of stuff before your inventory gets full, just to watch out for potential builds. Thief builds are meant to be quite rare (and you did manage to pull it off eventually!). I find that around the castle there is quite often (but certainly not always) a possibility to go into a thievery build. It is just hard to get it effective right from the start. another bug: I equipped an enchanted red dragon mail, luckily it was a red d-mail of resistance. I decided to press ‘x’ to examine the spell to see if anything changed mp or damage wise. If you press ‘x’ again while examining the spell the game prompts “you are too fatigued to identify the red dragon mail”. Im assuming if I had enough EP it would’ve wasted it reidentifying the armor! Thank you, will check it! OK! Just won my first game on the dev version. Was able to pull off an extremely over powered thievery build. I mean…. REALLY over powered. Really nice one, looks fun! Did you steal a lot from NPCs? Thank You for development version. I haven’t played so much already so my feedback will be small. I noticed that some monster (Grey Troll if I remember correctly) resistance to spell characteristic exceed screen size, so I couldn’t see calculated value. According to immersion mode, I am impressed with that feature. At first I was thinking: It is totally unplayable, but after some time I loved it. I found that switch my feelings about the game from clearly tactical (You see all the map) to more role playing game (You generate the map during movement). Because of this exploration process is slower and I felt I really stuck under the ground. I hope that immersion mode will stay forever in TGGW of course as a option for people who doesn’t like it. I agree with cheapmiami, it is rather hard to build character with very high thievery, but very nice stats of the some “thievery” weapon, can be tempting enough to choose that way. More time is needed to check if and modification are needed IMO. > resistance to spell characteristic exceed screen size, so I couldn’t see calculated value. Thanks, will see what I can do! > According to immersion mode, I am impressed with that feature. Great to hear! I like it too, and it is definitely staying at least as an option. An important addition I forgot to mention in the tutorial is that you can press ‘v’ to access the map easier (which is kind of necessary in immersion mode). Yes, don’t expect a thievery build to really take off until midgame. > An important addition I forgot to mention in the tutorial is that you can press ‘v’ to access the map easier (which is kind of necessary in immersion mode). But, anyway the game is gorgeous. It definitely should be in the tutorial, I just completely forgot! no adrenaline? i kinda liked that mechanics. also my first impression is that the game is more difficult now. which is a good thing, i think. hm.. adrenaline should still be there, is it not working? is there any point of the broken items? are they more then nothing? oil seems to be kinda rare, i havent seen any yet. did you removed those playes with goblins and dogs and fire? or are they just more rare? Ok, I will see if there is something wrong with adrenaline. Thank you! Broken/trash items are mostly flavour, but they also become decoys because you don’t see what they are until you’re close. No, goblin guard rooms are still there and are not rarer. So they should turn up eventually. I have updated to changelog so you can see the changes there. btw autoexplore is a bit too exploring now i think. because it moves close to the items to identify them. Yeah, the idea is you can be lured to go in to a room where you normally wouldn’t go because you don’t see any items. Regarding autorun, I didn’t think about that! You are right that there is now a consequence of moving next to an item. However, I also think it would be slightly annoying to have it stop before. I have to think about this. basically you turned every item into a type specific chest, that opens when you step next to it, and drops a placeholder item even when it is empty. and this automatic chest opening what make autoexplore different. im not sure if this adds game value above chests. No, they went through, just for some reason they landed in the moderation queue. I think it might be because there are links in the comment. > Pressing X here does nothing. That’s a bit confusing. It’s a bug, the text shouldn’t be there. > Piece of Bread is pre-identified as simply “Item” and not Food? I tried to categorize these as how they appear visually. Since “food” can look in so many ways (and it might be hard to see if something is actually edible from a distance), I didn’t like the visual category “food”. So items I can’t categorize are simply “item”. Ideas to other abstractions are welcome. > goblin monk. I’m screwed right? Yeah… their new ability might be too strong if you have no alternative weapons. I may have to move them deeper of remove their new ability. > Money Monkeys turn invisible when fleeling now?! I don’t think so… can it be perhaps that you cast chaos bolt on it? Invisibility is a new chaos effect. > Congratulations and thank you again for this amazing work! > My only “concern” is that I guess it wouldn’t be easy for a beginner to get into it. Yes, this is certainly a challenge as the game becomes more complex. It will inevitable have some learning curve, even though I try to make everything intuitive. I think all information that is needed is available in the tutorials, the descriptions and the reference, although that requires some effort on the player. I have also *finally* started to work on keeping the manual up to date for those who like to read their way to the game. I think I have a cache problem with my browser, I didn’t knew that my comments actually did appears. Sorry. >> Money Monkeys turn invisible when fleeling now?! > I don’t think so… can it be perhaps that you cast chaos bolt on it? Invisibility is a new chaos effect. Ok so here’s what happen, I did use a Chaos Bolt on a Money Monkey and it turned invisible indeed but, as far as I recall, the effect wasn’t described in the Message box, I didn’t knew what the Chaos Bolt did. Then I find a Money Monkey in another part of the same Underground Level, it MIGHT (probably) have been the same, but I saw it, it wasn’t invisible. A few exchanges of combat, it turns fleeing AND invisible! > I think I have a cache problem with my browser, I didn’t knew that my comments actually did appears. Sorry. No, they didn’t appear at first: I had to manually approve them from the moderation queue. That’s why you didn’t see them at first. hm ok, it does sound strange and is really hard to test. Are you absolutely sure that it was the same monkey that turned invisible? A possible turn of events could have been that monkey number 1 is invisible and diseased which means that would still be invisible after resting. The second monkey you fought maybe didn’t turn invisible? It is a bug that you didn’t see a message about chaos bolt tunrning it invisible… the game doesn’t report things happening to things you can’t see, and the invisibility happens before the message… I’ll see if I can fix that. > A possible turn of events could have been that monkey number 1 is invisible and diseased which means that would still be invisible after resting. First I don’t understand why an diseased invisible monster would still be invisible after my rest… because it can’t rest while diseased? Second, after resting I was able to see and fight the Money Monkey before it turned invisible while fleeing. Was it the same monkey? Can’t be 100% sure sorry. It is possible that there is something going on here, let me know if you find a similar situation again. > Odd choice if I may (about not displaying rElec and rAcid). Ok “less important” was maybe the wrong way to put it, but more rare then the common resists. They are actually more visible now when they are shown in the status panel (standing out more), but it felt uneccessary to have rarely changing attributes in the main attribute window. Remember how “speed” also used to be a rarely changed, but still important, attribute. Speed is also now only shown in the status panel. I almost win my first run of the development version, but I am on twistys stairs and cannot go up because of the nearby closed room, where are 3 statues. Because of the noise I am all the time in combat mode.I enclosed save at google drive, but I am not sure is it save to publish the URL here. Thanks, I don’t need the savefile for this problem. This is (as you say) simply a conseqence of how the mechanics work, and have been there for a long time. The only way to proceed is to kill those statues (or possibly lure them away and teleport), which is harsh. I don’t quite like that it works this way either. I think the combat/explore mode also probably need to be reworked at some point. But since I have no solution right now that is both simple to understand and to implement, this is unfortunately how it will stay in v2.5. > I find it quite of weird how armor add more HP now. Isn’t the stat Armor enough by itself? That may well be the change I dislike the most personally so far. > I’ve been able to see Weapons of Acid before coming close to see that they were Throwing Axes of Acid. Is it normal to be able to see the “brand” of the weapon even before coming close? > Maybe if we have less than 4 EP there should not have to be a warning message about spending 4 EP to open a wooden door? Maybe just skip it and says that we can’t? > Would it be possible to have a “Discovered NPCs” entry please? That would be useful to remember who they are and what each of them do. > I find it quite of weird how armor add more HP now. The reason is that heavy armour really needed a boost. Unless you can get an armour attribute close to 100%, there is rarely a good idea to equip them since they penalize: noise, thievery, martial arts AND magic. Other ideas to buff heavy armour are welcome (they used to get elemental resistance in the past; then there is a risk that you could become immune to *all* damage types, and litteraly become immortal if combined with other sources of resistance). Yes, this is a really weird side effect and I don’t like it, but decided to go with it anyway. This is only when comparing equipment. I know it is a dual representation (this is related to the other comment about weapons displaying differently). This actually not new to this version, it has been like this for a while. > Would it be possible to have a “Discovered NPCs” entry please? I know it is needed, even more so in this version, but requires a lot of work and planning. Unfortunately not in v2.5. How about having heavy armor have a separate built in HP bar that gets depleted first? That way it provides the HP boost but isn’t awkward to remove. Maybe it can be “repaired” at an anvil/blacksmith to restore its HP bar as well. I’ve considered a similar mechanic before. The problem is that then it becomes optimal to wear the armour until its hp is depleted and then unequip it (since it doesn’t do anything more). It encourages the player to keep track of armour hp and then swap out i’m afraid. Well the armor would still provide its other benefits. Like 20% armor or whatever. Ah yes of course, didn’t think of that. Then the effect would be largely the same as it is now, without the weird side effect. That’s good! 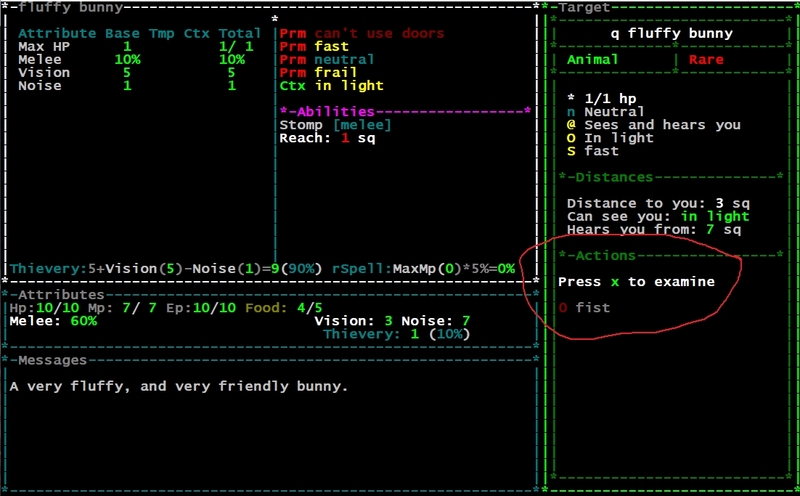 The problem is then that it is yet another mechanic to communicate to the player. But I will think about it, thanks for the suggestion! what if every weapon was martial, but just different start values, and most weapons would start from minus values? so you could master all weapons in extreme conditions (finding lots of martial items and using inventory slots for this). I think it would be more elegant and more fun. hm… this is an interesting idea! pickaxe is a weapon, not a mechanism. Actually intentional, it kind of looks like a weapon from a distance. what about to add a small plus to conjure light? it is has only disadvantage to enhance vision. it could be some kind of target light for example and add 10% plus to melee. Then that could be an alternative to shields. Since it raises your thievery by 3 I think it is already strong enough. Great release, I really like the changes. In particular, the NPCs seem much more useful now. I mostly wanted to report a that the game crashes when I fight a Dragon of FB (I was forced to, and I actually killed it (or almost killed it, the game crashed on that turn). Then I reloaded the game and tried again but then the game crashed in the middle of the fight). I was fighting with the shock prod and a lizard shield of pumelling, maybe that’s relevant. First a question, which version are you playing? It could be related to bug when losing melee% (from dragons bite) that I’ve fixed. If you are playing testversion v2.5C (from yesterday), then we still have a problem. I was actually playing the previous version, so I thank you for fixing that bug already, I guess! Equipping a Ring of Corrosion dropped my Martial Combo below zero, I don’t know why, furthermore, the negative martial combo isn’t displayed in the status window. It’s the slime. Slime reduces your martial combo (which can be seen as a ctx effect in z-menu screen). Martial combo is not visible in the status window when it is zero. This is something that should probably change if you are wielding a martial weapon. A better idea maybe would be to have an alert: “You Martial Combo will be negative, you won’t be able to use your [fists/etc]” Y/N? A prompt would be ideal, and was initially what I intended to go for. It turns out that it is actually quite difficult because equipment status can change for so many reasons and it is hard to cover the exact cases where I want the prompt. I’ll think about how to make the mechanics clearer, thanks! Actually I’m not in a slime tile… I think there’s a problem there. Ah, I was too quick there, you are not. But you unequipped your monk ring, which is why it fell below 1! Plate mail gives 4 HP, rusty plate mail gives 8 HP. I can’t imagine that’s intended. Another thing. Either I’m missing something, or the Clarity Charm is somewhat useless, since you can’t chant while confused. I tried to and it said I can’t because I’m confused. I was not wieldieng a sharp weapon nor aggravating either. hm.. that’s odd. Will have to check that then! Woo! Can’t wait to play it! – Does detection work in Immersive Mode? I think I was standing on a… warding rune, but didn’t see anything about the floating hand when it was off my current screen? – There’s a “won’t stack with other similar items” message on spells attached to items (at least with the deathsword). – Empty bottles sometimes (I had it happen once on an energy fountain. I had a full inventory, if that matters…) don’t disappear when filled. > Does detection work in Immersive Mode? Yes but not with 100% accuracy because things may be outside the border. You do get a little bit less information in general in immersion mode, so it is a bit harder. > how does martial arts work with melee stats over 100? Good question! The extra blow from >100% melee is added AFTER the martial arts sequence and only once. So it never hurts to be over 100%. Thanks. Yeah, it should probably not be there. My reasoning is that if it is cheaper than that, it is not much of a choice whether to coat your weapon or not. And yes, the availability. So if he still have poisons in stock, it is better to buy them first. Although the assassin has some coats that are not available as potions. > Empty bottles sometimes don’t disappear when filled. Yes, there seem to be a bug related to full containers in general, I’ll look at it. Thank you for reporting! I will see if I can reproduce it! Do you still have the savefile for the second crashes? Could you upload it somewhere or send it to me? You do play the latest version 2.5C dev, right? I think I have an idea now. It was probably due to a trap in the lava room which were causing a crash. Thank you! an idea: if you are diseased, and you try to eat to 5/5 then there could be an ‘are you sure?’ question. I do it a lot, i eat, then i realize i cant eat a silver leaf. In that case I’d have the prompt whenever you eat to get to 5/5, since it can be very dangerous in other situations as well. It adds a bit. Now if you want to eat to 5/5, because of the energy gain, then you have to take the risk of no heal. Also you can’t chocolate milk twice from 4/5. Btw a heal item that would give you nausea or bleeding would be interesting. magic staff isn’t martial either. The magic staves are not supposed to be martial, they are another category actually (despite sharing the name “staff”). The shimmering staff is also a magic staff. I think they could be martial too. I would be more elegant design. And also these magic staves are not too strong either with the 1 damage. Also it could be interesting if these could make a magic user character a bit more viable. Right now the wands just kinda utility thing. It would be interesting to try if they would be too strong if magic defense would be removed. boulders work differently from walls, if you move onto them a turn isn’t passed. teleport eye is epic 😀 it created super exciting situations. haha. it almost killed me twice 😀 It was at the start of a level. hmm is it still possible to miss a surprise attack (with a bow)? yes, you need high thievery to hit even a surprise attack. On the other hand you now deal significantly more (“surprise damage”) damage if you do hit. Intentional, you see the message “healer donates your money to charity” when you pay them. both this and the money thing are like exceptions from the general rule. Whether it is jewellery or not is not tied to a slot. Silver crowns are also jewellery but is in the head-slot. So which upgrader you go to depends not only on slot. However, you are right, I realized there’s no NPC that can upgrade the spiked collar. So now I fixed that so they are upgraded by armourers. Yes, I like to have some exceptions to the general rules. Healers always donates to charity because their theme is meditations. Yes, it is somewhat arbitrary. For water I think it makes sense because you need to go under the water. But maybe you should be able to pick up grass. 1. Is it weird that carrying a lit torch lets you steal things better? 2. Also, an iron club can’t break an ice block? How do I know which weapons are strong enough? 3. Container stacking is odd. Like if I want to add to a stack within a container, I have to move the stack back to backpack, then back to the container. 4. It is confusing that you can now have a very high Missile skill and yet the bows are useless because arrows are using Thievery instead. Maybe some weapons should use best of either skill when applicable? 1. Yeah, it’s a bit counter-intuitive perhaps, especially since its the opposite of what RPGs usually do. The way I see it is that it helps you see your surroundings better and to have a generally better perception. 2. its defined as dealing at least 2 points of physical damage or 1 point of fire damage. This is not documented however. 3. hm… not in the normal case it seems? Do you mean when a container is full? 4. Yes, I have been thinking about renaming the missile attribute to “throwing” to make it a bit more logical. Best of either would be an interesting category of weapons I agree. But I want thief weapons to be hard to use and that they require that you invest in noise/vision. Yes when it’s full like no more slots available. Should be able to add items to an existing stack though. But you are right, it should still show that it can be done. I’ll need to make other changes regarding full containers so I will look this one over too. Thanks! Real quick here: but the tower shield loses two martial bonuses when you upgrade it to a white shield (-2 -> -4). 1. Remember when I reported rusty plate mail giving more HP than the regular one? I seems like it’s like that for ALL rusty equipment. Also I feel like +8 HP is a little too much. Maybe +6 would be more appropiate? 2. Why 2 essentially the same charms? “protect” with +15 SH and “shield” with +20 SH. Maybe make “protect” give armor instead (probably more than 15 in that case)? 3. Upgrading enchanted weapons (and possibly other equipment) into suposedly unenchantable final versions is wonky: Sometimes they don’t show up in the upgrade dialog (which is what I assume to be intended), but sometimes they do and you can succesfuly upgrade them. I had a rapier of light, upgraded it into a masterwork rapier and it was no longer available for an upgrade. But the I equipped another rapier (no enchantments) and went to the blacksmith and then I could upgrade the masterwork rapier of light and it kept the enchantment. Similar thing might work with Enchanter, although I didn’t check. 4. Is monsters being able to shoot player through glass intended? Seems weird. I definitely got hit by lightnig beetles from behind a glass wall. 1. haha yes, and I know what the problem is now, will fix! 3. hm.. will look into it, thanks! 4. no, that’s an oversight, thanks! This is a super minor thing, but one of the meditations is currently called “basish undead” rather than (I assume) “banish undead”. Thanks for making this great game! Thank you very much 🙂 Will fix! -Its good. Every part is a good change. -I think monk could use a buff, it’s incompatible with shield and heavy armor which are really good now, the martial weapons are just okay, the scaling is never crazy because blocks stop combo (crazy scaling examples: thief weapons, dual-wielding, dragon mail). Censers don’t really pay off because nonlethals are lacking and the cost is high if you spam and I never really find myself saying “I’m definitely gonna need +25% armor for this next fight”, nor are censers well-suited for a temp-stack never-rest strat. The EP game being more generous is a contributor too as monks can’t use a lot of stuff. -Apple pies cost 30 to cook so last game I basically had 6 extra lives. That’s just the way it goes I guess. Obviously dragon mail and other stuff can be similarly absurd, but this thing doesn’t make a lot of sense and isn’t as fun. I realize it’s old. Hm.. ok, I agree some censers need a buff (but the healing censers are actually crazy since you can heal up almost indefinitely if you have money). As for your second point, I’m not sure what you didn’t like here. Is it the cheap apple pies or all the OP things (like dragon armour)? one quick question: being diseased and bleeding with 1 HP = game over? Resting diseased now would kill you! Yes, tmp hp + bleeding + disease is basically game over. Having tmp hp is like on “borrowed” hp. The only thing that could save you is if you manage to cure the disease somehow. Ok. Will remember in the future. Thank You for clarification.